This week in 1963, Governor John B. Connally was released from Parkland Memorial Hospital after spending ten days in recovery. 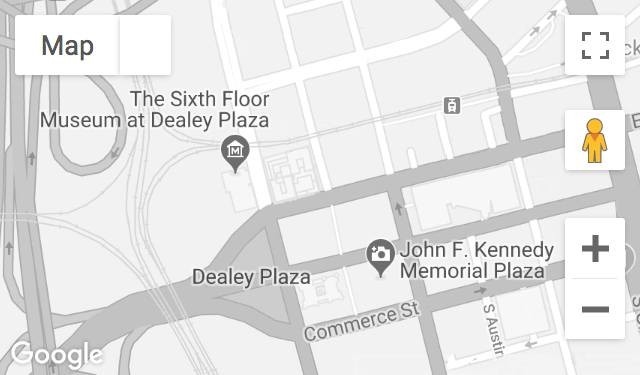 On November 22, 1963, the governor suffered critical wounds while riding in the presidential limousine through Dealey Plaza in downtown Dallas. The Governor was rushed to Parkland Memorial Hospital and doctors treated an entry wound in the back near the right shoulder, a broken rib, an exit wound in the chest, a shattered wrist and wound on his thigh. 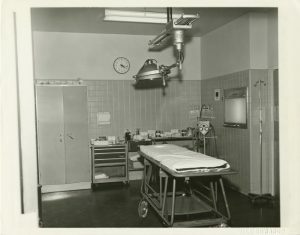 Inside of Trauma Room Two, taken November 1963, where Gov. Connally was treated. In the immediate aftermath, the Governor’s safety at Parkland was a serious concern. The hospital windows were painted black in the area near his room, thick steel plates were installed to deflect possible gunfire, and a guard was posted at the door. Both the public and reporters were eager to hear from Mrs. Connally. 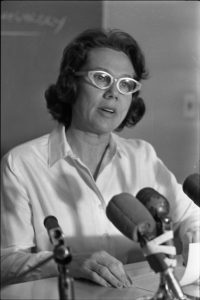 Nellie Connally speaking at a press conference on her husband, Governor John Connally, at Parkland Memorial Hospital in Dallas, Texas on Sunday, November 24, 1963. 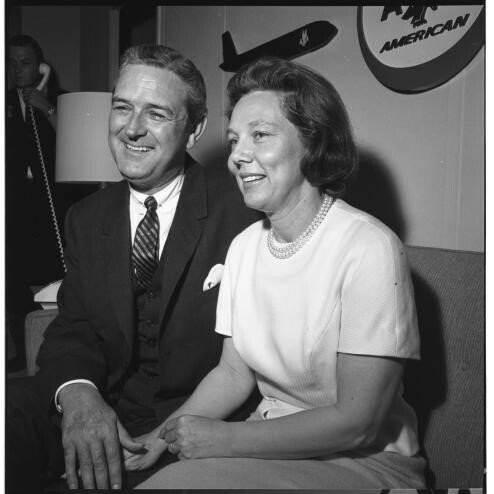 On Sunday, November 24, 1963, Mrs. Connally gave a brief press conference on her husband’s condition and the tragedy as she viewed it as a passenger in the presidential limousine. She would later document her experience in a book, From Love Field: Our Final Hours with President John F. Kennedy. During, Governor Connally’s recuperation, the seat of Texas government was temporarily held at Parkland Hospital, and a hand-lettered cardboard sign, reading “Office of the Governor,” was hung on the wall outside of the administrative suite which was used as a temporary office during his recovery. 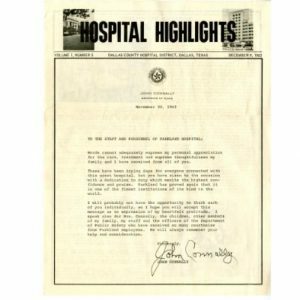 Four days after Governor Connally’s release in their hospital newsletter, Parkland published his message to the hospital staff and personnel, conveying his appreciation for the treatment he received during his stay. The unsteady signature was a result of his having to sign with his left hand, since his right wrist was injured and in a sling. To see more of the Museum’s collections and learn the history behind them, visit our online collections database and our Reading Room.